In the Feldenkrais Method we, Feldenkrais practitioners invite our students to explore movements during ATM (Awareness Through Movement) class and FI (Functional Integration) lesson. Our students are not exercising, but exploring movements. This sounds confusing, but this separates the Feldenkrais Method from other disciplines such as Yoga or Pilates. Let me explain the difference between movement exploration and exercise in a simple way. This is only my own interpretation and other Feldenkrais practitioners may explain differently. Movement exploration is process-oriented while exercise is goal-oriented. Movement exploration is open-ended while exercise is close-ended. Because of this nature, exercise tends to narrow down a pathway directly to its goal, which becomes a correct way and makes other pathways incorrect ways and discouraged, sort of. Movement exploration, on the other hand, leads to multiple pathways as there is no specific goal/destination. As you can imagine it's easy to get lost, but there's a very good chance you will discover something along your way of getting lost that you would not if you were only going towards a very specific destination. This is like the difference between hiking a mountain to get to the top (exercise) and hiking to get lost in the nature (movement exploration). You're much more likely to make surprising discoveries if you were wandering and exploring the nature. I am not suggesting one form is better the other. 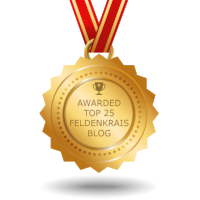 I am explaining this difference only to highlight the difference between the Feldenkrais Method and the other disciplines as there is confusion and misunderstanding about the Feldenkrais Method. If you're ready to explore some movements, join ATM class or come to FI session!